Life with Lesley: Get unjunked with UNREAL candies!! A couple of weeks ago I had a party. An "unjunked" UNREAL party. I was getting to introduce a new type of candy to a group of friends. I can't tell you how excited I was! Have you tried these new candies that have pretty much redefined what candy can be? 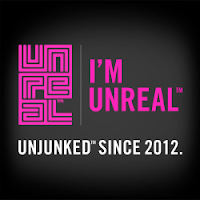 It's called UNREAL and it is AWESOME!! Oh my gosh, I am totally addicted to the Chocolate Peanut Caramel Nougat bar. And the best part is I don't have to feel guilty eating it! UNREAL has a mission - they want to "unjunk" the world and they are doing that by starting with candy. Most candies are full of hydrogenated oils, artificial flavors, corn syrup, synthetic colors, and GMOs. Not UNREAL candy! UNREAL has all the good stuff in it - like cacao (cocoa), more milk, more peanuts, cane sugar, and organic palm fruit oil. 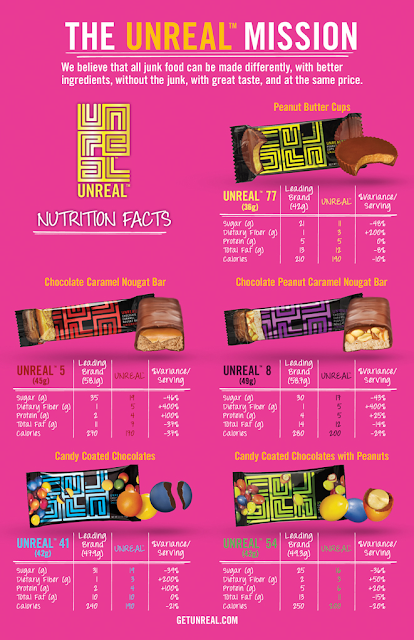 UNREAL candies have 30% less sugar, 60% more fiber, and 250% more protein! Just look at this chart below and you can see all the amazing nutritional facts. It's hard to believe that a candy this good (and yes it IS that good) and not be bad for you! Each of these candies are delicious and rival the name brands they are patterned after. I admit I was a little hesitant to try them because normally healthier food just doesn't measure up...but I am so glad I was wrong. Even my husband, who is super picky when it comes to chocolate, said "We need to get some more of that stuff!" Here are a few of the other things that have been said about UNREAL during the party. "Are you serious..this has less sugar? It sure doesn't taste like it. It tastes normal." "This is the best tasting candy. I can't believe it's better for me." "Oh my goodness. I'm never going to eat another brand again." " Hand me another one of those." I loved that I could share all these wonderful tasting candies with friends. I know that they enjoyed it as well. I mean, this candy is amazing in the fact that it isn't as bad for you, it is tasty, and it can be found in stores that you would normally shop at like Kroger, CVS, and Staples. You don't have to go to a health food store to get it. Overall, my family and friends thought it was great. If you've tried it....what do you think? Or if you haven't, do you think this is something you'd be interested in?